One thing I remember about my first trip to Granada is the tapas culture and the amazing food the city has to offer. During my first evening there I met with a local girl in one of the tiny squares of the old town, sat down at a terrace and ordered a glass of wine. With it, the free tapas arrived. The more we ordered, the better the tapas were. Since then, I have been to Granada many times. 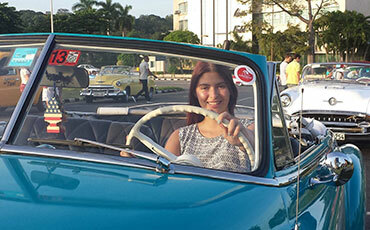 I was last there in August, when my friend Sandra visited me from the Netherlands. We went there for a day trip and all we did was literally just eat our way around the city, going from tapas bar to tapas bar. But my love affair with the tapas in Granada has no end, so yesterday I went back to experience the best Granada Food Tour run by the Spain Food Sherpas. Granada is one of those few places in Spain that still keeps the tapas tradition, where a plate of food is served for free, when you order a drink. They vary from place to place, but from what I’ve noticed, the more drinks you order, the better the tapas are. During my last evening in Granada I stopped by La Cuchara del Carmela, which was close by to my hotel, and ordered a glass of wine. Immediately I received a large plate of fried cod with lemon and salad. Granada is a city where four different cultures blended together over the years and influenced the local gastronomical scene. Tapas in Granada is not only food, but a way of life. 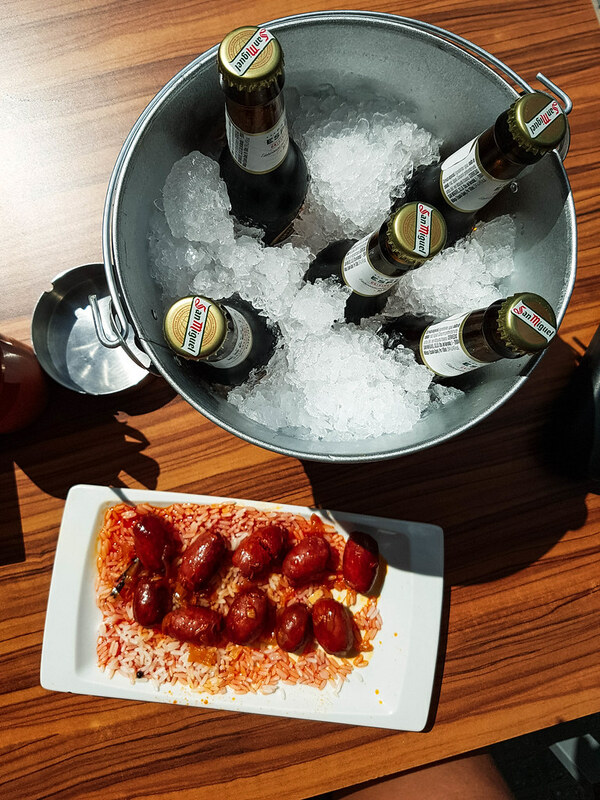 Every evening, no matter how the weather is, the city’s bars and restaurants will get filled with locals meeting their friends or family for tapas. Locals very rare pay for tapas, they usually eat whatever the waiters bring with their drinks, so it’s always a surprise. As a foodie, I am always interested in the local flavours and there is no better way to discover them than through a food tour run by a local. Spain Food Sherpas was a perfect choice to take me on a Granada food tour around the city and show me both its traditional and its modern flavours. I opted for the evening tour, so I also got the chance to see Granada all dressed up and ready for the upcoming winter holidays. I met Laura, the guide for the evening, very close to Plaza del Campillo, a very central location in Granada. We got along straight away, noticing we had quite a few things in common like languages we spoke and places we have both been and lived. The group was very small, we were 4 in total, which I liked as it gave everyone the chance to interact better and get all their questions answered. 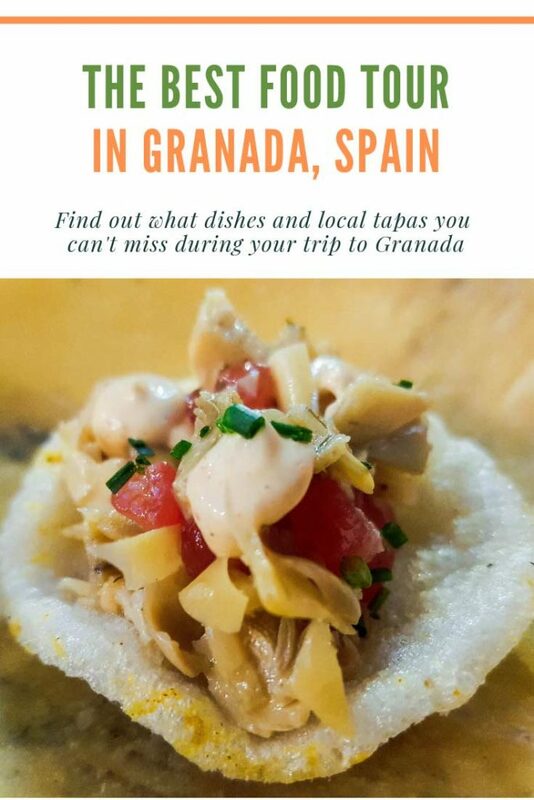 This Granada food tour didn’t take us to the touristy parts of the city but to the places where locals actually go out for tapas or to buy their food. I didn’t hear English at all in any of the places we stopped at to try the local tapas. The Spain Food Sherpas is run by local residents of Granada who are very enthusiast and love their city to bits. Laura was so knowledgeable and during the tour she gave us so many other suggestions on where to find other best food in Granada. For example, the following morning I went and had breakfast at Mummo, from her recommendations. A tiny local bar full of locals, with the most delicious jamon and tomato tostada which was only 1.7 euros! Their food walking tour in Granada is not only about the best dishes but also about the city itself and its rich history. We started our tour directly with dessert, so our first stop was at Abuela Ili, a tiny artisan chocolate store just off Paseo del Salon. There, for almost half a century, the family of Abuela Ili makes chocolate using natural ingredients from the Pampaneira – a small mountain village in the Sierra Nevada mountain range. They import their cocoa from South America and mix the highest quality local ingredients to create new chocolate flavours that will take your taste buds through a journey of sensations. One of the most intriguing varieties I tasted was the goat’s cheese white chocolate. I also tried for the first time the 100% dark chocolate and wow, that’s strong! Other favourites were the banana milk chocolate, the coconut milk chocolate, the dark lime chocolate and the pepper dark chocolate. 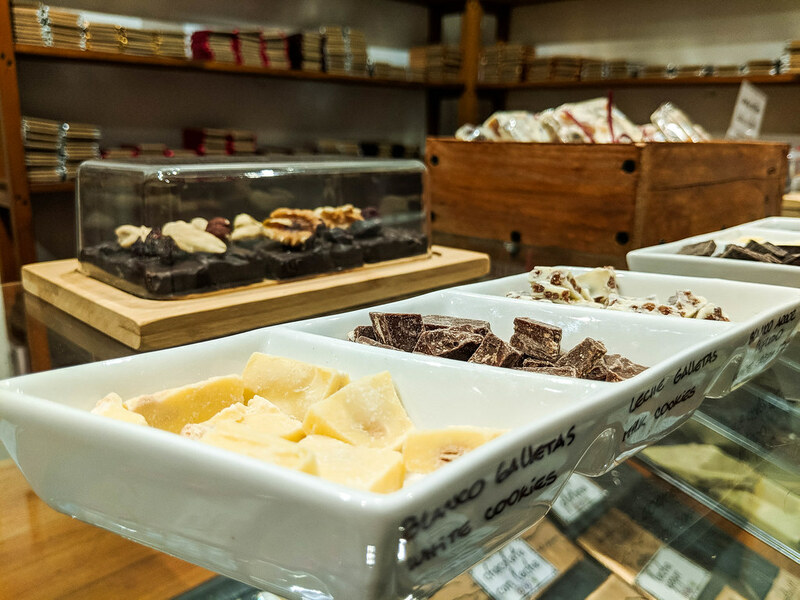 Besides chocolate bars, at Abuela Ili you can also find hot chocolate, pralines and cocoa beer. Even if you haven’t yet been to Spain, you have probably tried jamon – the most famous Spanish ham. A couple of years ago, during a food tour I did in London, I have learned about the differences between jamon and what I needed to know before buying it. And at Iberica, Ivan has confirmed the same things. There are different types of jamon in Spain, depending on how the pigs are fed and where do they grow. The most common (and cheapest) jamon you will find everywhere is the Iberico – and you can recognise it by the white trotter of the pig’s leg. These animals are feed grains and grown in farms. The iberico ham is cured for 24 months and you can see it in stores with a white label. 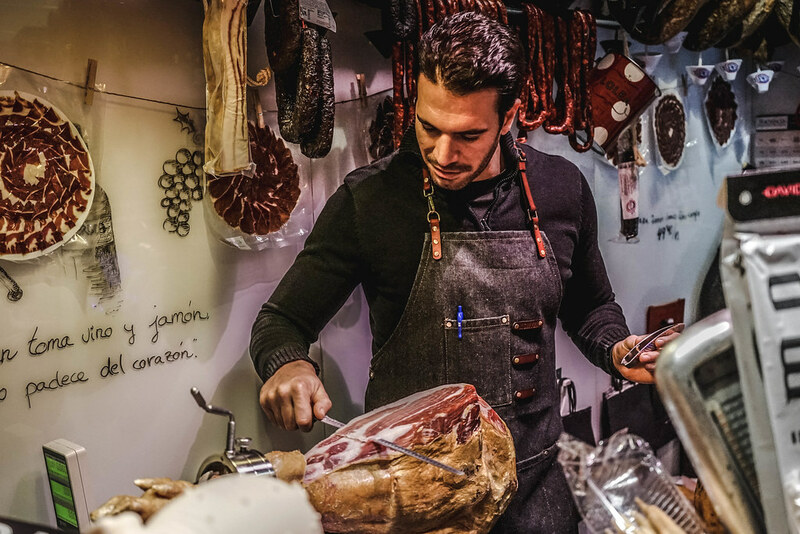 The finest type of Spanish ham is the jamon iberico de bellota, which is recognisable by the black trotter of the pig’s leg and by the red or black label it comes with. This type of jamon comes from free-range pigs that roam free around oak forests and eat exclusively acorns. They are pure-bred Iberian pigs, with a distinct flavour because of their diet and exercise. The meat it’s cured for 36 months. Depending on the ancenstry of the pig (which is written on the label), a leg of jamon iberico de bellota can easily cost 1000 euros! Most of the jamon iberico de bellota from Spain comes from the North of the country, close to the border with Portugal. Ivan carefully carved three types of jamon for us to taste and paired them with a glass of apple wine. We tried the jamon serrano, the iberico and the iberico de bellota. Besides the jamon, the small shop also sells all sorts of local delicacies, like cheese, sauces or olive oil. 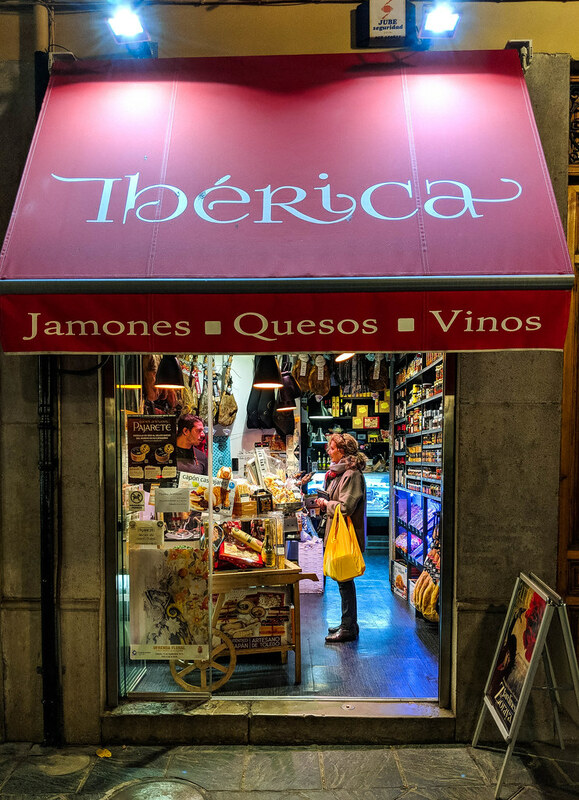 I left not only with some jamon but also with a jar or black aioli, one of green olive tapenade and a bottle of Vertijana 3 – an award winning local coupage of temporanillo, cabernet sauvignon, merlot and syrah. You can tell I’m a big foodie, right? 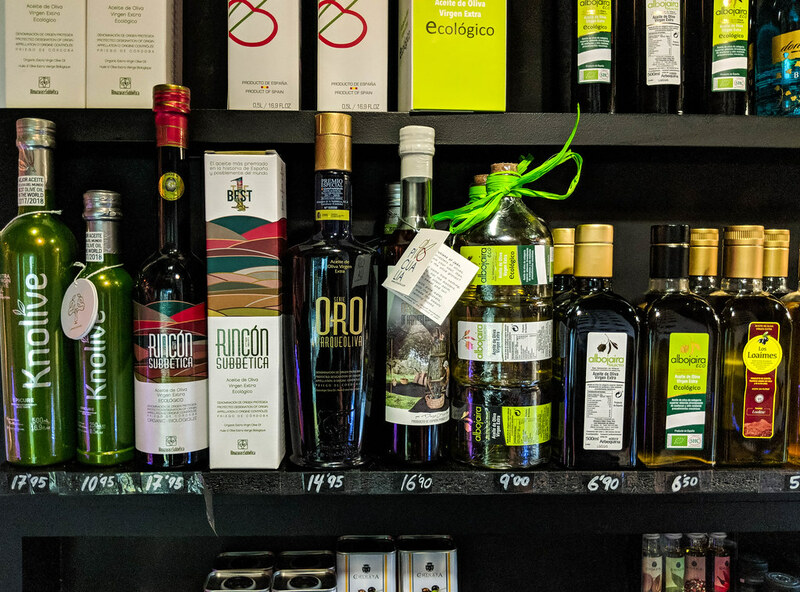 Olive oil is one of the most important ingredients in the Spanish cuisine. Not only in cooking with but also in tasting on its own. There is no Spanish breakfast without generous amounts of olive oil on top of tostadas with tomatoes or jamon. Or simply just olive oil and salt. And no wonder, as driving from Malaga to Granada, the road passes through miles of hills covered with olive trees. There are different types of olive oil though, some used more for cooking and some for tasting. 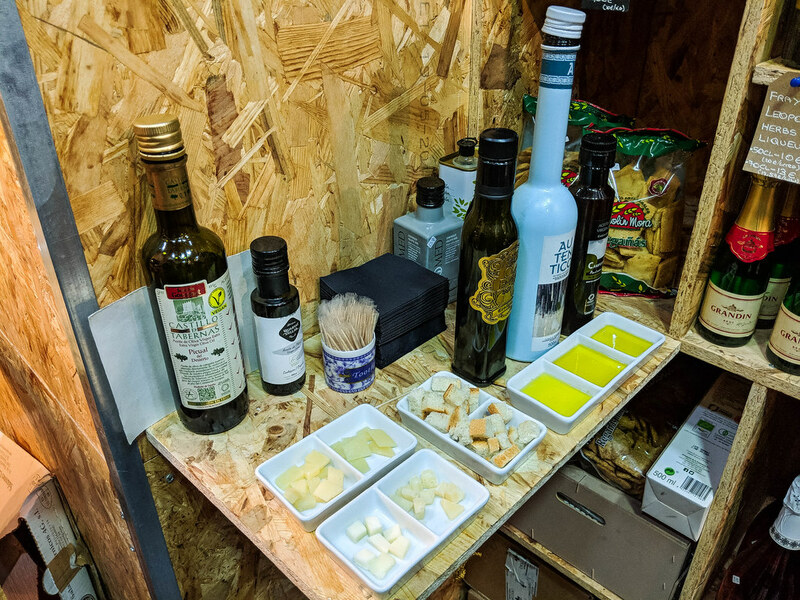 At Andalucia Delicatessen we got the chance to try three special locally produced olive oils, including Autentico, which was awarded with a gold medal this year at the NYIOOC World Olive Oil Competition from New York. Autentico is a very intense olive oil with a complex flavour which develops inside the mouth: it begins with fresh and strong fruity flavours of green apples, becomes smooth and finishes with a spicy kick. It’s a really special olive oil that it’s meant to be savoured raw, on toast or in salads. Did I buy a bottle to take home? Yes, I did! Alfredo, the owner of Andalucia Delicatessen is very knowledge about the items in his store and he was very eager to offer us more local organic products to taste, such as gazpachio (a cold tomato soup) made only with eco tomatoes and herbs, and the cinnamon spiced vermouth produced no further away than the Mercado San Agustin, by La Picateria (they have some delicious olive & seafood pinchos in the market, if you have time to pass by). And yes, I bought both to take home. We also tried an array of different artisanal cheese here, from fresh goat’s cheese to matured sheep’s one. Located in Plaza de la Trinidad, Oliver is one of the oldest shops in Granada, being in business since 1850. 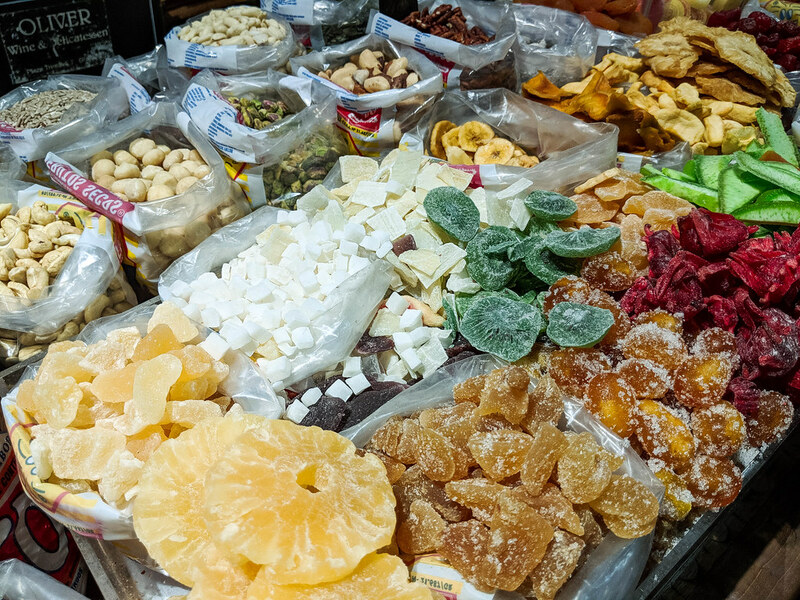 Whilst the shop is quite small, the entire counter is filled with bags of different locally produced nuts and dried fruits. These days they even have a Christmas mix, with nuts and chocolate pieces. In Spain, people do eat a lot of nuts, especially in the evening, when they are watching tv. At Oliver we tried salty peanuts, caramelised nuts and fresh pistachios. 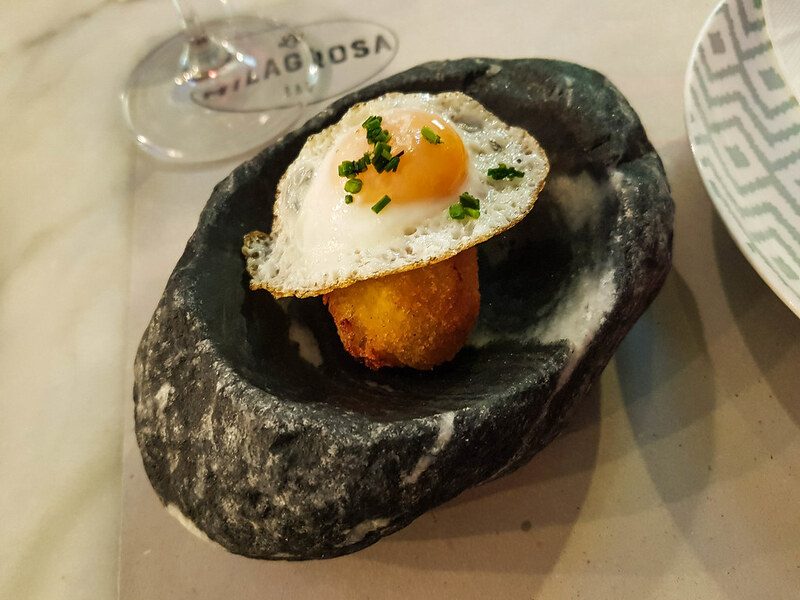 Our next stop was La Milagrosa, a modern Spanish tapas bar & restaurant with an award-winning chef. Even if chef Nicolas Sánchez Chica is very young, he won the “Tapas de Granada” competition in 2017 with his interpretation of a lamb taco. All the ingredients used at La Milagrosa are sourced from Granada and the nearby Sierra Nevada mountains. At La Milagrosa we had the pleasure to taste two of chef’s Nicolas Chica tapas, an oxtail croquet with a poached quail’s egg on top and the marinated artichokes with a mustard and honey sauce. I love Spanish croquets and I order them quite often when I go out for tapas. However, it’s always a hit and miss, depending on their filling and how they have been cooked. Nobody likes a soggy and oily croquet! Needless to say I was eager to try the oxtail croquet of chef Nicolas Chica, and oh, it did not disappoint. The interior of the croquet was soft whilst the exterior perfectly crunchy. The quail’s egg on top balanced the sweet flavour. I have tried artichokes for the first time last year, when I spent a month in Tuscany. I kept hearing about them in American cooking shows but as they are not so popular in my country, I never justified the high price of buying jarred ones. But oh my, what a revelation it was when I had my first pasta with artichoke sauce! And how sorry I was for not trying this amazing vegetable earlier! The marinated artichoke was served on a rice cracker and topped with chives and a honey & mustard sauce. And the taste was fabulous, an explosion of flavour and freshness with each bite, with hints of sweet and spicy from the creamy sauce. Truly an outstanding dish I could eat over and over without ever getting enough of its taste. I enjoyed the tapas together with a glass of Ribera del Duero wine, crisp and with a complex flavour. Our last stop of the day was Chikito, Federico Garcia Lorca’s favourite local in Granada and originally, Café Alameda – opened in 1909. During the past century this restaurant was a very popular spot for artists to gather around and have drinks. In the middle of the restaurant you can still see one of the original columns dating from when Chikito was still Café Alameda. Today the restaurant is owner by an ex Spanish football player, but the classic décor and the traditional recipes are still bringing crowds of locals in every evening. 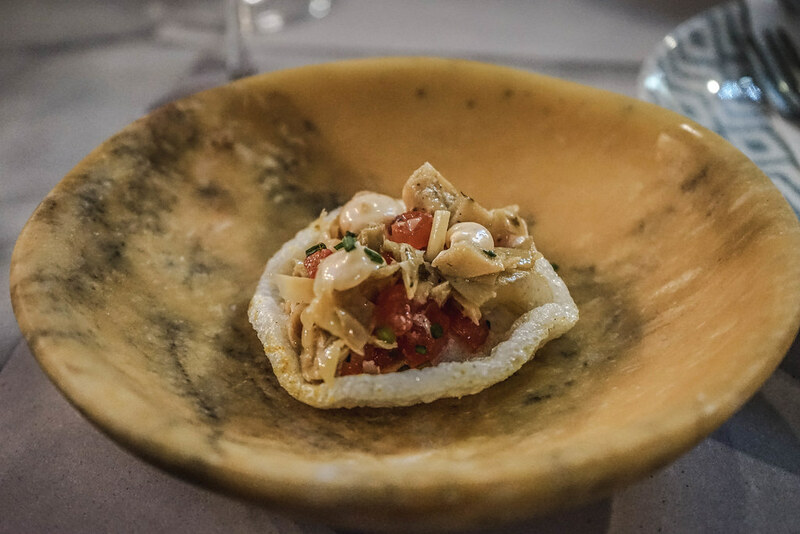 At Chikito we tried three traditional local tapas that you can only find in Granada. 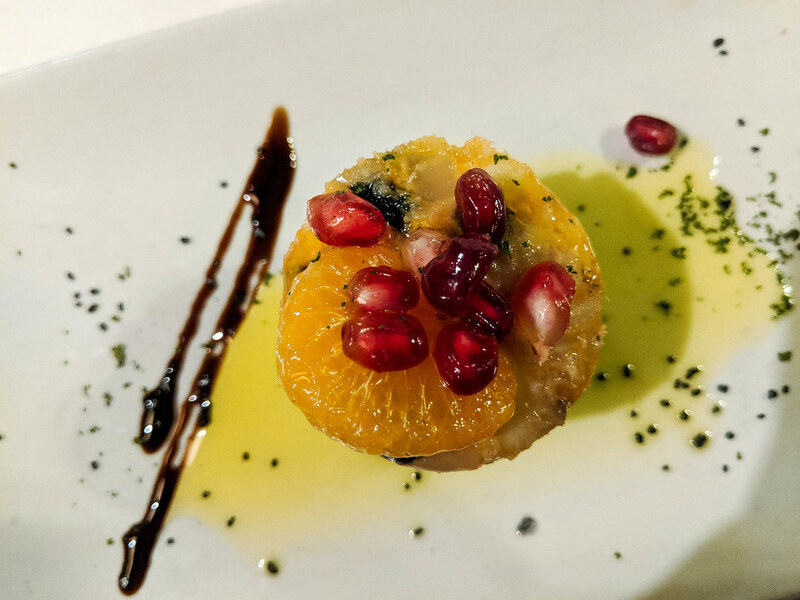 The first one was the Remojon Granaino – a cold salad with pieces of cod, onions, olives, oranges and pomegranate seeds. Not only that it looks beautiful, but it was also delicious. The combination of ingredients might sound strange and to be honest if I read them on a menu this dish wouldn’t be my first choice to order, but I’m glad I had the chance to taste it. It was absolutely delicious, with different flavours of sour and sweet bringing this dish together. 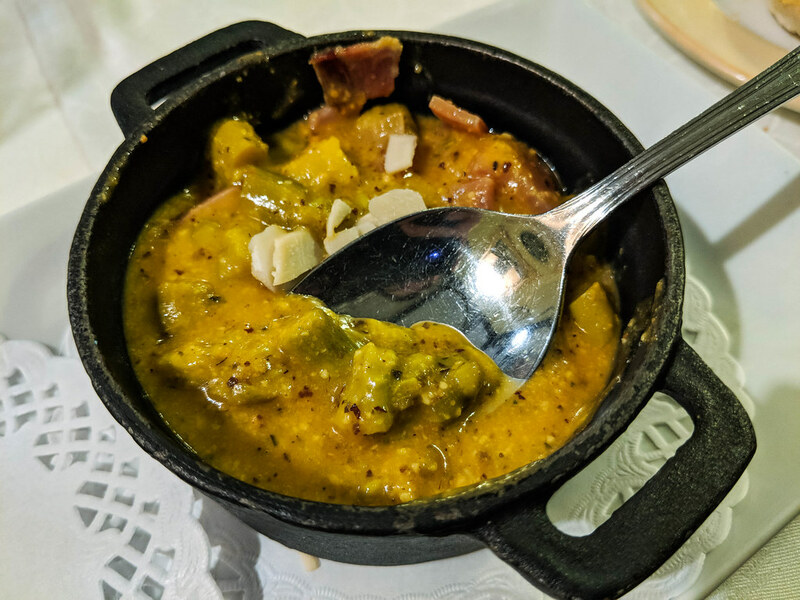 The second tapas we had was the Asparagus casserole, a thick soup with jamon and almonds. This is said to have been Lorca’s favourite dish. I liked the combination of sweet asparagus with salty ham and the almond crunch. The last dish of the evening had to be dessert! And what other than the traditional dessert of Granada, the piononos? 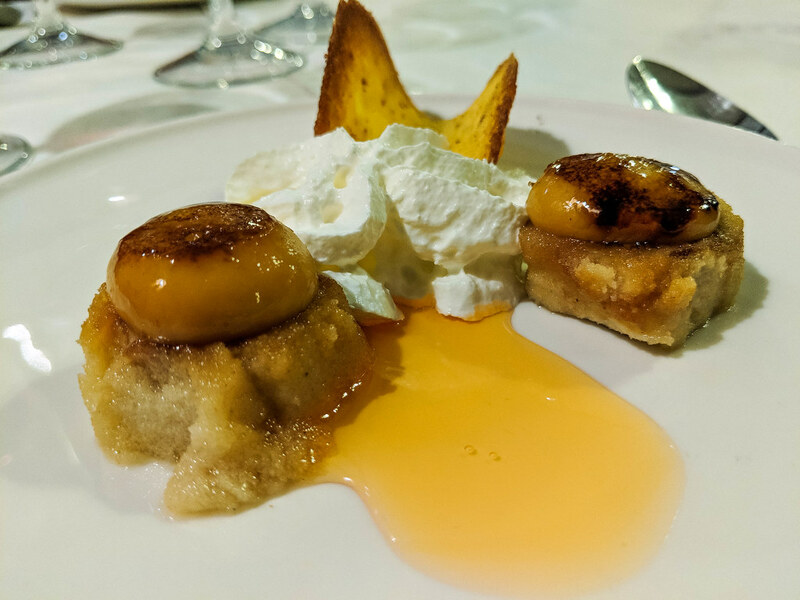 Practically an upside down sponge cake, pionono translates as “the 9th Pope” and it’s a desert that was created to honour Pope Pius the IX’s for having proclaimed the Immaculate Conception doctrine. Pionono is fermented in a sweet syrup and served with cream and a biscuit, which is meant to resemble to Pope’s hat. Filled with cinnamon, it’s a delicious dessert. Disclaimer: Please note that this post has been written in collaboration with Spain Food Sherpas and I was their guest on the food tour. However, all the opinions and thoughts in this article are my own. Wow!! Granada’s foods look sooo amazing and delicious! I will definitely ..definitely add this on my bucket list! I have never been to Spain but maybe there is somewhere near me that has Jamon! I really want to try it because your photos look amazing! Spain seems so dreamy! Especially because the food is free when you order your drinks. For that reason alone I would become a social drinker, haha. The asparagus casserole looks so good! I am drooling!!! The food looks delicious, yum!!! Thank you so much for the recos. Definitely saving this post for later! I visited Spain for the first time last year, and cannot wait to return next year. So much to see and do. This is just making me so excited! I definitely need to try that asparagus casserole. Looks mouth watering. I haven’t taste a tapas yet, so i don’t have an idea what it actually taste like, but with your undying love affair with it. Im sure i gotta taste it. The oxtail croquet with a poached quail’s egg on top and the marinated artichokes with a mustard and honey sauce looks so delicious. I would love a food tour with food like this. Must save post! This post encompasses all that there is to planning a trip to Spain, from food to tourist attractions. Great read! My favorite way to explore a city is to eat my way through it! It looks like Granada is a wonderful place to do that. Would you believe I’ve never had tapas? I live in Nashville and our claim to fame is hot chicken. I’d like a piononos with my oxtail croquet with a poached quail’s egg on top, please. What a gorgeous place to visit! Iw ould love to try so many of these foods! I don’t drink but I would go just for the food! I’ve always thought that I’d enjoy a real food tour. It sounds like a good time and lots of intriguing sounding things to taste. I bet I’d have enjoyed the chocolate store. Wow all of this food looks absolutely delicious! My hubby would absolutely love everything here…he is a total foodie 🙂 Thanks for sharing! Where do I even begin!? Cheese, chocolate, and Spanish ham? You are speaking my love language. I am a big fan of Tapas and while don’t have the knowledge of how it is prepared internationally, I love however they make it in India. I would love to visit Granada to explore its culinary side. Thanks for such amazing tips. Oh my! all these tapas look and sound delicious! I haven’t been to Andalucía in so long, it’s time I take a short trip there again! Oh my gosh! I love tapas. We only have a few restaurants here that serve tapas and these are even limited. I would like a food tour like this! I am all about food, and all of this looks tasty! I have never heard of tapas, but I need to find a place that serves them thats for sure! My mouth is watering! OMG the food all looks and sounds so delicious. I hope we can visit one day and try it all! Big fan of tapas! Thanks for sharing. Yum, I’m drooling over reading this post, and that Spanish guy too lol! I love tapas, and it’s great they still keep the tapas tradition alive there. I’m not sure which is my favourite, but as a chocolate fan, I’d head first to Abuela’s! I’ve never known what tapas meant until just now. I think it’s so cool that you can pretty much eat for free as long as you by a drink lol that sounds like a good time to me. Glad you’ve had good experiences in Granada! I’m a big fan of tapas so my taste buds are loving this post. I am a huge fan of tapas! And anytime we travel, we always love knowing where local people enjoy eating. That is usually where the best food is. Yummy food. I love food adventure too. looks like a lot of delicious food. We just love to explore Spain and, to eat also. After Portugal, Spain is one of the best places to eat around Europe. Granada in on our “must do” list and, you give here such good idias to eat, will for sure use it when we visit Granada. Wow, I just love tapas food. This place look fantastic and I wish I can be there to taste all the delicious food. This really make me want to eat tapas at tonight’s dinner… Can’t wait! I’m loving thepictures! They keep me entertained while reading in the details. I would love to get to try the jamon iberico de bellota because it feels like an interesting jamon flavor to have! Having it to be bread with naturally and to be cured for 36 months! We do have some tapas – like / tapais-inspired food in our country but I hope to have a taste of the real deal in Spain! What camera are you using? Those photos look superb! Wow, such a detailed post that would be so helpful to plan a great trip to Granada. Loving the pictures so much. I love this kind of post where they feature great food from different place on earth. The food feature here looks very yummy and tasty, I hope we all get the chance eat it all. I love Spanish food! I used to live in Madrid and ir de tapas and el tapeo are the best! The tapas were one of my favorite parts of barcelona. I’d love to travel here to try them out too! I have never had tapas before! I am always down for food and fun together. This looks like it was such an amazing experience. Very well said. When in comes to tapas, going to Granada will be the very best option. These photos make me want to hop on a flight to Spain. What a great time it looks like you had. Your blog made me extremely starving! I want to travel here to tr them. the food photos are so beautiful and food look so yummy and tasty, glad to see that both vegetarian and nonvegetarian options available. 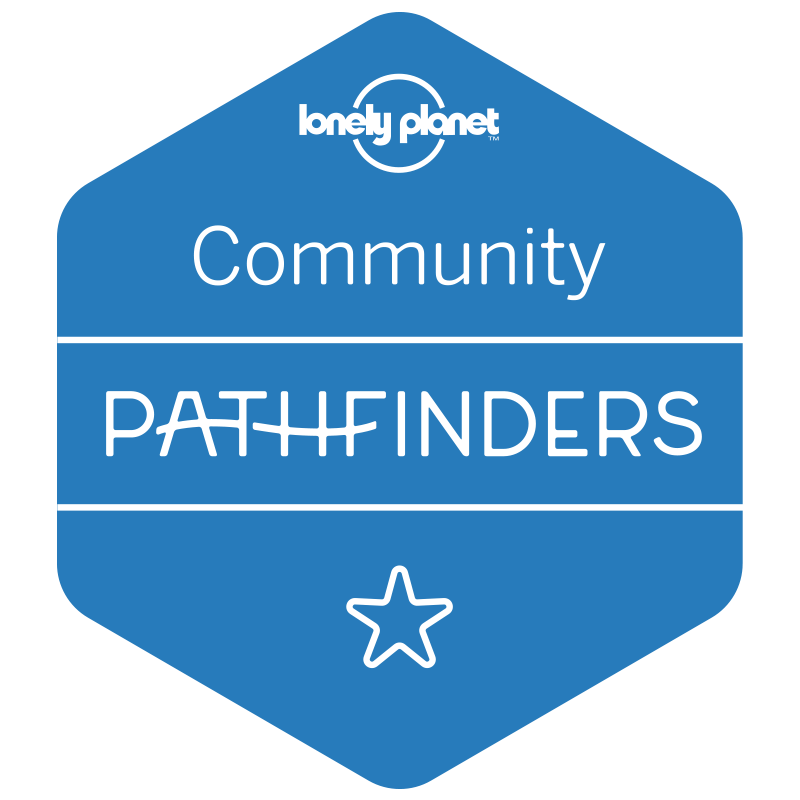 I have always thought to go for a food trail. Your blog gave me the perfect push for that. This experienced of yours make me to like the tapas food the more. Though I once come across a post about the tapas tradition. But with this I think I have a place to visit. Thanks for this wonderful information. 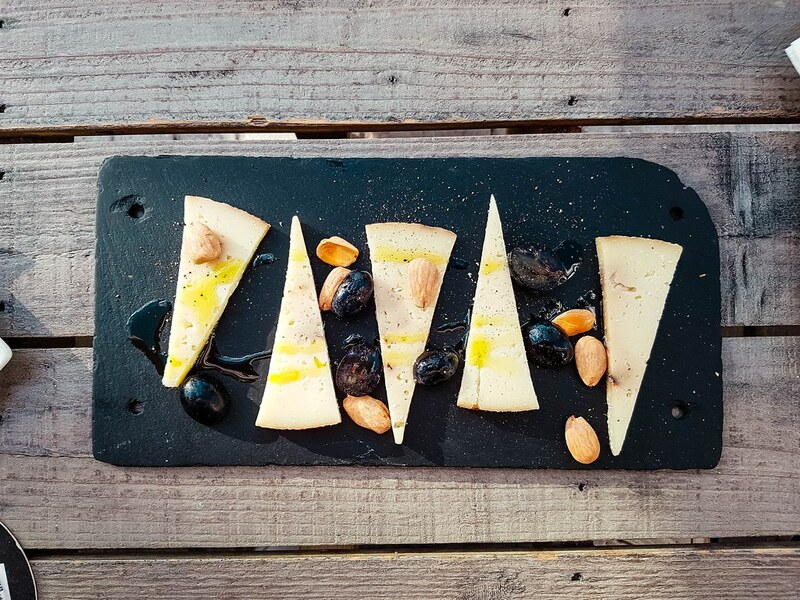 I love Spain and traditional Tapas, this sounds like a fantastic and delicious food tour. One to add to my list I think for next time I’m in Spain. Great post!